An idea for reducing health care costs that largely gets left out of the Affordable Care Act debate: build bike lanes. They pay off handsomely, according to a recent economic study. Bike lanes increase the likelihood that people will ride, according to the report by Jing Gu, Babak Mohit, Peter Alexander Muennig published in Injury Prevention, a British medical journal. 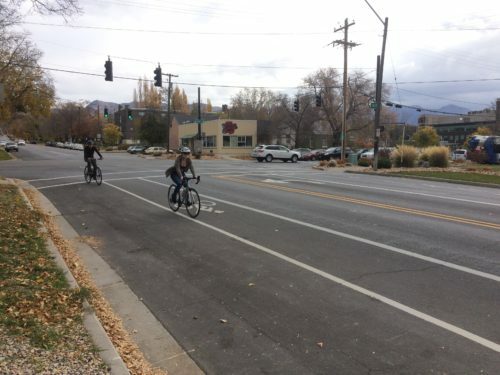 “We conclude that investments in bicycle lanes come with an exceptionally good value because they simultaneously address multiple public health problems. Investments in bike lanes are more cost-effective than the majority of preventive approaches used today,” the authors say in their study, The Cost-Effectiveness of Bike Lanes in New York City. The authors fault most academic research on bike lanes for not distinguishing adequately between different types (protected lanes, marked lanes, on-street bike routes, etc.). Yet they don't distinguish in their own analysis. They apply theoretical economic assumptions that may not apply in the physical street world. But they conclude that adding 45 miles of bike lanes in New York City “may increase” the likelihood people will ride by 9.32 percent. The analysis says that every mile of new bike lane increases ridership by .4 percent. They also say that bike lanes reduce injuries by 25 percent. The Center for Injury Prevention & Control at the Centers for Disease Control funded the study. See goo.gl/6SoCjK. Reference: Gu J, Mohit B, Muennig PA The cost-effectiveness of bike lanes in New York City Injury Prevention 2017;23:239-243.